Yes! This is just about the first time ever that I’ve made a resolution and stuck to it for more than about a week. If you havent caught up on my resolutions you can read about them ﻿here﻿. It’s so gratifying when you decide to do something and then actually do it until it is done. I really don’t know why I don’t do it more often? Actually, I do, but that not the subject of this post. This post is to revel in the joy that I actually finished something. And a big something at that. 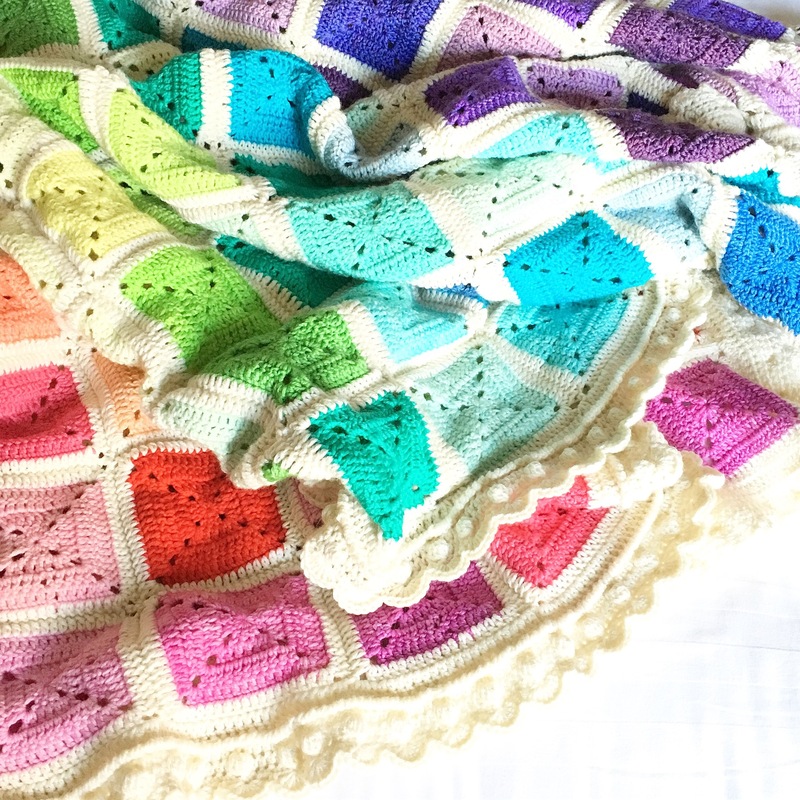 When I signed up to the blanket club at the start of 2015, I had lots of good intententions to prioritise this project. 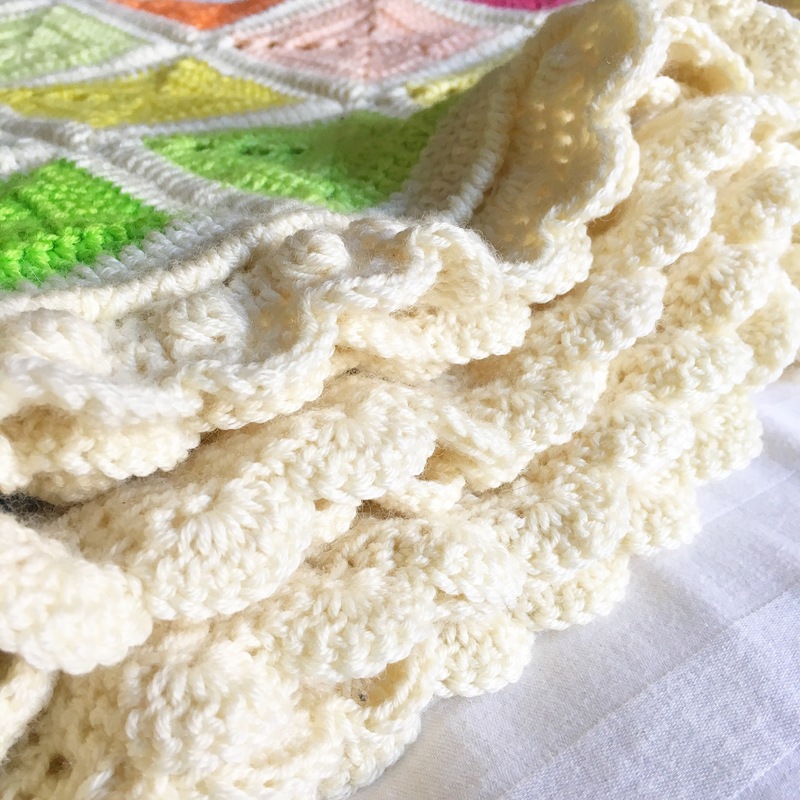 I would make the squares each month when the yarn came in, above all other projects. That lasted until about March, and then things started to slip a little further each month until we got to the end of the club and I realised I wasn’t even close to being half way through making all the squares. This was a blow because I had hoped to present my children with a blanket each for Christmas that year. The realisation dawned that if it was going to be a Christmas present, it would have to be Christmas 2016. You can see how these things get away from themselves! Anyway, it became my travel project. For a period of about 9 months, I took a ball of the yarn with me everywhere I went and diligently made squares. Actually this made the making very easy. It took me between 15 and 20 minutes to make one square and I got between 9 and 10 squares from a ball, so I spent all the odd 1/2 hours waiting while my children played at various soft plays, theme parks and beaches, making the squares. It was the ideal portable project. Then I finished the squares and the project quickly became extremely non portable. But I was on a roll and I quickly (well, relatively quickly!) assembled the first blanket. This is it! And finally, I’ve finished the second. I’m going to let the (many!) photos speak for themselves. ﻿I can wait to put them on the children’s beds. Next up, The Blanket Of Doom. I kid you not! So, having made a resolution to finish my wips, and declared it publically, I do actually need to get on with it the daunting task. So, what’s been stopping me? Well, apart for the obvious distractions of children not yet back at school and the apocalyptic state of the house post Christmas, it’s actually not as straight forward as it might seem. Do I go for the nearly there, quick to finish wips? Or would it be better to knuckle down with the longer task of finishing a blanket? Obviously, the easy wins of the quick to finish wips, results in the best headlines. I can just hear me saying “ooh, I’ve finished 15 wips and it’s only January 5th”. But, I know myself and no sooner are these words fading into the ether than the thought “Gosh I’ve done so well, surely I deserve a reward?” will pop into my head and I’ll be wrestling with the idea that a little cast on couldn’t hurt. And once I’m there, I’m never going to pick up an unfinished blanket wip with the idea that it will ever be completed. So, blanket wips first then. Actually this is not such a terrible prospect, as last year, I gave away all the barely started blanket wips I had (there were several), and ripped out another couple I wasn’t feeling the love for, so all I really have is a couple of gorgeous blankets in Cuddlebums yarn which are crying out to be finished. Also, at this time of year, it’s nice to sit under a blanket while you knit or crochet. So, here I am, enjoying the last of the twinkling Christmas lights and the peace of the house now the children have finally returned to school, catching up on a backlog of TV and, making progress on my shades blanket club from 2015. It’s the second of two blankets I’m making from this club (one for each twin), so I know what I’m getting and I’m just as excited about it as I was when I opened the first box of yarn two years ago. I’m arranging the squares a little differently on the second one compared with the first. Partly this is due to having slightly fewer squares but also I just wanted to try something different. And there will be a need to identify which blanket is which, speedily (and often) in order to resolve conflicts about who has who’s blanket. Here is a progress shot. I think, maybe a week of focused effort and it might be finished. And here are some pictures of the first blanket. Aren’t they just wonderfully sunny in a dull damp January? So, that’s it for me, so far. Some of you said you might join me in the finishing wips resolution. How are you all getting on?